The OX has been designed specifically to tackle a host of transport challenges, and to undertake crucial daily tasks, such as collect drinking water and transport grain, fertilizer or building materials. The OX’s cabin provides spacious accommodation for three people, and the driver is seated centrally. This layout has specific advantages for the world’s developing countries, some of which have right-hand traffic, while others drive on the left of the road. All-terrain ability is crucial for the developing world, and the OX has been engineered to perform as well as, or better than, a four-wheel drive vehicle across a range of surfaces, while offering durable mobility with two driven wheels. The OX’s revolutionary nature extends beyond the vehicle design because, uniquely, it is capable of being flat-packed within itself, enabling it to be transported more efficiently around the world. It takes three people less than six hours to create the flat pack in the UK prior to shipping, and six of these flat packs can be shipped within a 40ft high-cube container. Assembly labour is transferred to the importing country, where local professional companies will be employed to assemble and maintain the finished vehicles. Three skilled people can put an OX together in approximately 12 hours. This is a fascinating, production ready prototype by famed Formula 1 vehicle and McLaren F1 designer Gordon Murray. It is plain to see that the Ox brings key innovations in transportability, utility and quite possibly safety. It will be interesting to see how the Global Vehicle Trust (GVT) solves the chicken-and-egg question of transporting flat-pack Ox trucks to remote, inland areas of the African continent with poor infrastructure and difficult accessibility requiring the traversal of rough terrain. 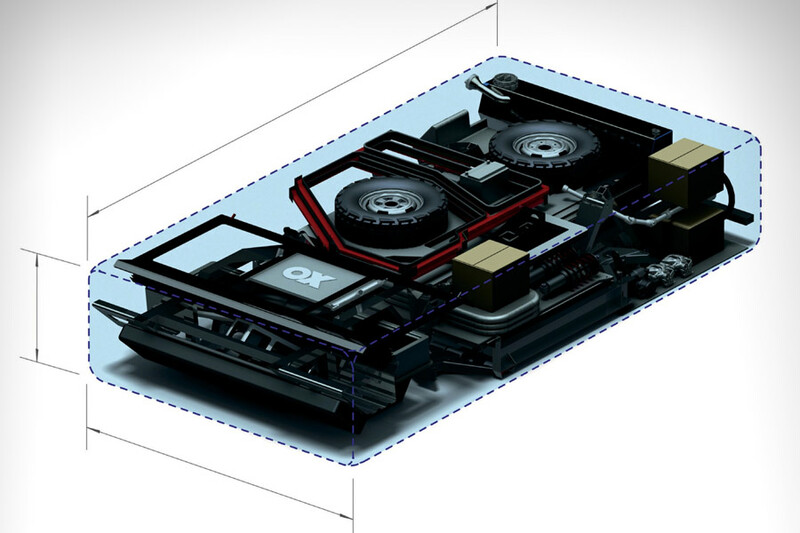 Can a flat-pack Ox kit fit inside a fully assembled Ox truck? Or will specialised land transport be required? The press release does mention that "it is capable of being flat-packed within itself" but it is unclear whether that phrase refers to all Ox truck components fitting within a single package, or whether an assembled Ox truck can carry an Ox kit in its loading area. I am inclined to believe the latter. Regardless, as stated in the press release, the flat-pack design will undoubtedly reduce shipping costs and improve economies of scale. Above: Diagrams demonstrating how the Ox can be flat-packed. The engine and gearbox must be packed separately. Workhorse trucks carrying heavy loads, through rugged terrain in poorly developed countries need to foremost be durable and cheap to maintain and repair. The Ox appears to address this problem through the use of bolt-on interchangeable parts, including an identical three glass panel windscreen and identical parts on both sides of the vehicle. This will not only reduce the hassle of on-field repairs and emergency parts swapping, but from a supply economics perspective, makes it much easier for GVT to produce as many spare parts as cheaply and efficiently as possible. Above: The three panel windscreen. Each glass panel is identical and interchangeable. Other features, such as the dual purpose tailgate that can function as a loading ramp and bench seat frames that can be placed under the wheels to act as a firm 'sand ladder' when travelling across soft surfaces evidence the functional, well thought out design of the Ox truck. Clearly, it is unlikely that a commercial vehicle targeted at undeveloped countries will meet Western safety standards. Specifications for the prototype Ox truck do not make mention of safety features such as Anti-Lock Braking (ABS), airbags or even a crumple zone. Despite this, the Ox truck, by virtue of having some form of seating for passengers, will unequivocally be safer than current solutions such as cramming people into pick-ups. Above: Mock-up demonstrating how passengers can be seated in the cargo area of the Ox.